Specialty Car Services has several specialized pieces of equipment which allows us to offer you a wide variety of Tire Services to satisfy your needs. Tire Balancing is performed to ensure that your tires and wheels spin without causing vibrations. This procedure is performed by checking for any heavy spots on the wheel-tire combination and compensating for it by placing a measured lead weight on the opposite site of the wheel from where the heavy spot is. To extend the life of your tires and the front end parts of your vehicle, it is recommended to rotate and rebalance your tires every 6,000-8,000 miles. Our computerized 4-wheel Alignment service consists of adjusting the angles of your vehicle’s wheels so that they are perpendicular to the ground, and parallel to each other. 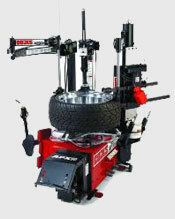 The purpose of these adjustments is to maximize tire life and also to improve the handling of your vehicle. Nitrogen is denser than Oxygen: This means the larger molecules escape less easily from tires resulting in a more gradual loss of pressure over time. According to the Michelin Tire Manual, a tire that is inflated with Nitrogen loses its pressure 3 times slower than if it were inflated with air. Nitrogen is moisture free: Pure Nitrogen inflated tires experience less steel belt and rubber degradation. Nitrogen use also reduces valve and wheel corrosion. Nitrogen provides longer tire life: Nitrogen inflated tire run cooler and require less maintenance according to the Goodyear application bulletin.